Posted on December 24, 2014 February 6, 2015 . by Patrick Johnstone. Leave a comment. Thing have gotten a little crazy around here, and by around here, I mean here in the internet. It all seemed to make sense at some point, but now after having set up a Campaign, then getting elected, things have gotten out of hand. I suddenly find myself with two Twitter handles, two Facebook pages, three webpages/blogs, 5 e-mail accounts, 5 phone numbers, two smart phones, and not time to generate any content on any of them. Twitter: I’m bringing @NWimby to an end. It was a fun 14,000+ tweets, but it is time. I needed to set up a different account for the campaign (for a variety of reasons related to Elections Act authorizations, linking the account to my NationBuilder account, etc.) and had I not been successful, I probably would have just nuked that one and gone back to @NWimby. However, the way things turned out, it makes sense to keep the @PJNewWest handle, and start re-building the follower base. I suspect @NWimby will sit there as a largely-ignored legacy for a while, because there are some epic Twitter exchanges in there. So if you want to follow @NWimby, follow @PJNewWest. During the election, I used Facebook to transmit info, to identify supporters, and for a little self-promotion. However, I also found that it was a popular media for critics to say less flattering things about me. I have no problem with that, I bring that on myself every time I open my fat mouth. The problem on Facebook is that criticism rarely appeared in pages that I frequented, but instead on pages I have no connection with, so I was rarely able to respond or correct the record. And this got me thinking about how Facebook essentially fails as a social media. Now that my NewsFeed is dominated by auto-running videos of people doing stupid things with trucks, I cannot even fathom why I am still there. So my Facebook pages are still active, but I may not be there much. I have no strategy yet. Webpages: I have been blogging pretty consistently for 5 years now, first as GreenNewWest then as NWimby, and in parallel with TignPat. I also did a bit of blogging during the campaign on my campaign website. Again, at the time it made sense to keep these separate, and if the Campaign thing didn’t work out, I could quickly cast the new site to the ether. Now I need to re-jig. I am going to keep blogging. In the short term, that will be at NWimby. Sometime early in the New Year, there will be a new PatrickJohnstone.ca website, and NWimby will go away. I will port all of the 5 years of NWimby goodness to that new site, so the legacy will still be there. The new website will be the main portal for my non-Official-City-of-New-Westminster communications, and should be significantly spiffier than the current mess that is NWimby. The same lame content, though. And TignPat will pretty much stay where it is, being updated whenever adventure takes place. E-mail: I’m working on getting away from the Telus webmail thing, as I have had that e-mail address for so long and used it to register for so many different things that it is essentially a place where spam goes to die. I set up a Gmail account for the campaign, and it seems to be the most adaptable format for most things. I will be making some adjustments related to the webpage, so I will probably create a new e-mail address that will forward automatically to Gmail for my personal stuff, like info@patrickjohnstone.ca does now. Stay tuned, but in the meantime (and foreseeable future) you can use that address. 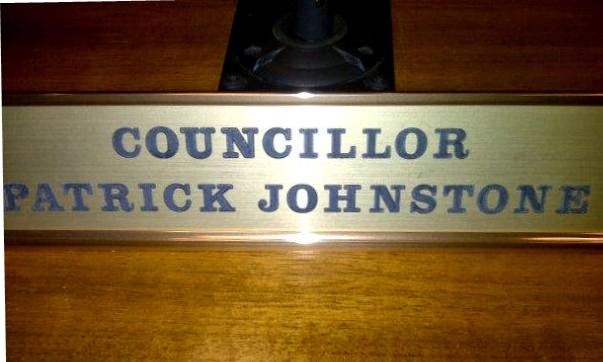 For Official New Westminster Council business, I have been given the e-mail pjohnstone@newwestcity.ca which I will use for just that –official City business. If you want to complain to me about something, send kudos, have a question related to the City, you can use that one. However, remember that e-mail belongs to the City, and because of FOI rules and such, you might not want to send me anything there you wouldn’t want to see published on the front page of the Newspaper. For much the same reason, I will NOT be using my Gmail account for any official City business. Phone: The Original Social Media(tm). I have an unofficial phone number which I will hand out to people on a need-to-know basis. I suspect MsNWimby and I have reached the point where our land line is no longer a useful utility, so that number might go away. If you have my 778- cell number, you can use that. Much like withthe e-mail, the City gave me an official number as well, and if you want to chat about City business or have a question that just can’t wait, you can try 604-679-6784. I might answer, if I can figure out this Blackberry thing. And that’s the breakdown on my communications future. Let’s see how it works out. I say this fully cognizant that there are a few outspoken people in New Westminster who will purposely try to blur that distinction to create a controversy, if it suits their agenda. That is to be expected, and part of what a politician has to deal with if (s)he wants to continue to be as outspoken and opinionated after the election as (s)he was before the election. So just to be clear: I have opinions; I am not the City. I hope everyone has a great Holiday, doing the things you love with the people you love. See you in what is promising to be an exciting 2015! Posted on December 20, 2014 February 6, 2015 . by Patrick Johnstone. 2 Comments. Now that everything is looking official, we can start preparing for the TransLink Transit Transportation Transportation & Transit Referendum Plebiscite. The Premier Minister of Transportation will let the people Registered Voters of BC the Lower Mainland vote on increasing the PST installing a new Provincial MetroVancouver-only PST-like Congestion Improvement Tax to feed the piggies at the TransLink trough finally reduce congestion build a SkyTrain to UBC long-needed improvements to local transportation infrastructure. Ugh, I should not listen to AM radio. It should be no surprise to my few readers (Hi Mom!) that I am supporting the “yes” side of this referendum, and will be actively campaigning in the spring to help it pass. So I will be writing about the referendum on this blog until most of you are sick of it. To start things off, I want to talk about what I see as the biggest narrative being drawn up by the NO side forces: the argument that TransLink does not “deserve” more tax money. This sounds like what we hear on CKNW daily: “We should vote NO to send them a message”. The “them” to whom the message is being sent, and the content of the actual message, are shifting details to the overall narrative: Send them a message. Anyone who thinks this referendum is the appropriate place to launch some sort of “taxpayers revolt” is missing their mark in a pretty significant way. A NO vote will not tell the Province or the Mayors that “we pay too much tax already”. Trust me, they already got that message ad nauseum. This is the actual reason the Premier has taken the cowardly route and created this silly referendum exercise that allows her to dodge the blame for any costs related to regional transportation infrastructure, why the Minister of Transportation has nixed all of the earlier alternative payment schemes, and why the Mayors have been diligently pushing back saying “this is your responsibility, not ours”. None of them want to own any tax once it is implemented. Instead, a NO vote will deliver the Province exactly what they want – an excuse not to invest in public transportation, a download of their responsibility to provide transportation infrastructure funding to the Lower Mainland, and a way to reduce their operational costs by reducing public service. They will proudly talk of being prudent protectors of the public purse (despite their actual record: see BC Place, Site C, Golden Ears Bridge, BC Hydro, etc. ), and if the Mayors step up to fund this basic public service through Property Taxes, the Premier play to the CKNW crowd by calling them reckless spendthrifts that throw public money around needlessly with no regard for the poor suffering taxpayer (see downloading of ambulance services, mental health, housing, etc.). Further, a NO vote will send this Provincial Government the message that when they want to fund a public service (the Massey replacement, an $8 billion dam of dubious need, a new roof for a stadium, etc.) they will just do it without consultation, but when they don’t want to fund a public service (Transit, public health, housing, schools, etc.) they will send the plan to a Referendum and get the public to say no when they don’t have the balls to say so themselves, because they can count on another misplaced “taxpayer revolt”. That will be a very, very bad precedent for governance in our Province, as with a continued reduction in public service, those taxpayer revolts will become more reliable. That is how the neo-liberal downward spiral is mapped. If you agree we need to stop cutting transit service (two bus lines reduced in New Westminster in the last year alone! ), and need to start re-investing in transit infrastructure, then this YES vote is the only way we will see that happen in the next decade. Because the only “Plan B” anyone can see on the horizon right now is funding this entire thing through property taxes, and I cannot imagine the Mayors will agree on a formula for that in any kind of short order. And there is no way in hell the Provincial government who just witnessed a NO vote on public transit funding is going to then turn around and introduce any kind of new funding scheme for public transit. Worse, after a NO vote, the Province is still going to move ahead spending ~$3 Billion on a replacement for the Massey Tunnel, and will then spend billions more on suddenly-required Oak Street Bridge replacement, and widening Highway 99 and or 91, then a new Second Narrows Crossing, a 6- or 8-lane Pattullo Bridge, and on and on with bigger highways and bridges as we try to figure out how to move a million more people through this region when the public transit system fails. And they sure as hell are not going to have a referendum on any of those projects. You won’t get to say NO, because by saying NO this time, you already said YES. This referendum is a dumb idea, and represents terrible governance. However, this is the situation we are in, and we need to make it work, for the future of the region. The Mayors have climbed Mount Impossible and come up with a unified vision and a reasonable (if sub-optimal) way to fund it. We need to get behind it, or a generation of transit infrastructure growth may be lost, and the impact on our region will be worse even than the damage that was done by the Worlds Widest Bridge. So I am going to be going door-to-door in the spring, and I am going to be reaching out to as many people as possible – we need to vote YES for more sustainable transportation infrastructure and for the future of our region’s sustainability. Posted on December 14, 2014 February 6, 2015 . by Patrick Johnstone. 1 Comment. Part of my plan for becoming a City Councillor, and one of my promises while campaigning, was that I was going to open up what takes place at Council, and communicate more directly from the Council Table. So this is the first of what I hope will be a 4-year series of blog posts following after Council meetings. There are a number of things that will complicate this process. There are things we discuss in camera that I cannot report out on according to the Local Government Act, and there are projects that will go to Public Hearing that it would be in inappropriate for me to share opinions about prior to that hearing as per the same Act. However, Council does make decisions every meeting that cause people to wonder where the decision came from, and why we voted the way we do. It is reported out in Council Minutes, but I hope to cast a little light on that, from my personal viewpoint. I cannot, of course speak on behalf of the other Council members, the Mayor, or the City as a legal entity – everything below are my opinions and observations only. So keep these caveats in mind, as we dive into the agenda of my first meeting. December 8, 2014. Most of these topics relate to reports provided in the Committee of the Whole earlier in the day, and can be read here. I also apologize that this report took almost a week to get organized. Hopefully as I get more into the groove, I will figure out a more efficient way of writing these things while still making it understandable to people. Hey, I’m new at this! This is the Mayor’s prerogative, but Councillors volunteer by listing our preferences, and he makes the final determination. I’m happy with the assignments I received. ACTBiPed has been a passion of mine for a number of years, Access Ability is a natural addition, as there is a lot of overlap, especially in the “Ped” part of Pedestrian. I am glad to be co-chairing Environment with Councillor McEvoy, who has been running that committee for the last few years, and there are few issues coming up where that committee will be front and centre (Urban Forest Management Plan, Kinder Morgan pipeline, etc.). The Youth Advisory Committee is new to me, but I am look forward to getting more involved in the youth programs in the City. I am also going to be involved in the Energy Management Committee, which should dovetail well with Environment, and will be interesting as the City further develops its CEEP and plans for a District Energy Utility. A new Mayor has a few complete powers, and one is the ability to set up new Committees and Task Forces, and these better than anything else so far demonstrate the Mayor’s priorities for the upcoming term (the difference is subtle: A Committee may sit forever to support policy goals in a specific area, whereas a Task Force is usually a temporary group, assembled to get a specific task done, then disband). I’m really happy to be named to the Transportation Task Force, and the Public Engagement Committee. Both represent areas I talked extensively about during my campaign, and it looks like I will be talking about both of these at length over the next few years! We tabled this discussion out of respect for Councillor Harper, who could not attend this evening because of a family emergency. He had done a lot of work on this file, and we did not want to make a decision as a Council on this until he was able to provide some public input. Look for this to be a big topic of discussion in the New Year. This is a bit of an adjustment of how we are going to structure Council meetings going forward. For those familiar with New Westminster Council, the end of the meetings often included a “Council Reports” section, which included announcements of upcoming events or items of community interests, and talked about events that councillors had attended, but often sounded more like an extended “social calendar report out” for the Council. That may be fine, but if it goes on to 45 minutes at the end of a long meeting, it is of dubious value to the community, and takes up a lot of staff time. Mayor Coté suggested a better model, and after some discussion, we decided to adopt it. The existing “Council Reports” part of the agenda will be re-termed “announcements”, and will provide each Councillor an opportunity to add topic-specific announcements to the agenda, to be presented at that time (i.e. upcoming events). Councillors will still have the opportunity to provide reports on special topics, such as reporting on their attendance at a UBCM conference or providing details of a special project they are leading, but the detailed review of the Councillor’s social calendar since the previous meeting will (hopefully) become a thing of the past. We’ll see how this goes! This is the start of a rather lengthy process to get the location where Wait for me Daddy (the event) occurred, and where Wait for me Daddy (the sculpture) is currently located, designated an Historic Site. There is more to the site than just that event, as this is a site where First Nations lived, it was the edge of the City’s original “Chinatown”, it was the place where troops assembled to be shipped east for WW1 and WW2. The photo is the most recognized historic event, but there is a long and complex history to the site, that Parks Canada may choose to officially recognize. This is the start of the conversation, not the end. This was a report received by Council reviewing the work done to date on this study. We received it for information, but no action was required at this time. There will be an opportunity to be heard on this issue on January 26, 2015. This is the site of the fire last January, and I am glad to see that the redevelopment of the site is moving so quickly. Not much to report here, except that it will be a rental building to replace the rental building that was lost, and it will be built on the same footprint. This is the preliminary report on a plan to renovate and preserve the historic Dontenwill Hall. This is a heritage preservation project that will be going to public consultation before coming back to Council, so I will hold comments for now. This came from a committee of which I was a part, so I know more about the history of the situation. The ACTBiPed has for several years raised concerns about the prioritization of pedestrian movements over “traffic flow”, especially in some key pedestrian areas like Uptown and Columbia Street. This isn’t just the whinging of a special interest group, this is supported both by the City’s Pedestrian Charter, and by language in the new Master Transportation Plan. There are two recommendations here: one emphasising the need to educate both pedestrians and other road users on pedestrian safety; the other to look at areas of the City where there needs to be more emphasis on the safe and efficient flow of pedestrians than on the less safe, less efficient flow of cars. On Recommendation 1 there was no debate, and the City is already working with ICBC to provide improved pedestrian safety education. You have probably seen the recent ICBC ads talking about this issue, and the City is handing out reflective wristbands and danglers to encourage pedestrians to be more visible during the dreary winter days. Recommendation 2 asked if more intersections in the City could adopt the pedestrian model of 6th and 6th – currently the only intersection in the City where the “walk” signal automatically activates every cycle, instead of requiring activation by a pedestrian. For this to prove more efficient (for foot and vehicle traffic), it requires a higher concentration of pedestrians vs. cars than occur anywhere else in the City other than 6th and 6th. The downside to this model is that the audio signal (the chirping you hear to alert the visually impaired about the signal activation) would cycle every time, 24 hours a day. This creates a bit of a noise nuisance for any residents who live near the intersection. We discussed whether the audio signal alone could be activated by the push button (as it is now), leaving the lighted signal to turn automatically and letting the audio signal only sound where required. This might actually reduce the noise nuisance for these intersections. Staff will report back on whether this is viable. In light of this, we also asked that staff again review a few of the intersections in the City that are now seeing increased pedestrian use (I picked out Columbia and 8th Street, 8th Street and Sixth Ave, and Begbie and Columbia; Councillor Puchmayr added Columbia and 6th and Columbia and 4th) to determine if making the intersection “pedestrian emphasised”. This is a strange piece of public engagement by the Province, and strangely timed. That the Provincial Government would initiate a Transportation Plan consultation at the exact same time as the Translink Referendum details are being ironed out is strange. After doubting that the Mayors would be able to come together with a comprehensive plan for regional transportation investment, the Ministry is seemingly wanting to run it’s own process parallel to this. Meanwhile, several major transportation investments of dubious value have just been completed (PMH1, Sea-to-Sky) or have been promised come hell or high water (Massey tunnel replacement) without the approval of the Mayors and in contrast to the stated goals of the existing regional plans that impact transportation in our region – the Livable Region Strategy and Transport2040. Combined with the more integrated projects (such as the long-overdue Evergreen Line), we still don’t know what the effects of these major shifts in our City will be. Regardless, the City’s response is pretty easy to put together. New Westminster provided comment drawn from its own Master Transportation Plan, and from our position of agreement with the existing regional transportation plans, and added a call for more consultation with the public and regional authorities prior to plan finalization. The part I added was about starting the discussion on a costing mechanism for these works. Specifically, we need the province (who are the only jurisdiction with this power) to start discussing updated regional tolling policies. And that may take some background. There is no doubt that the current ad-hoc tolling method is not serving New Westminster, or the region, fairly. The traffic impacts we have seen since the tolling of the Port Mann, and the Province’s insistence that the Pattullo (and New Westminster’s surface streets) are a “toll-free alternative” for regional traffic, are hurting the livability of our City. These problems will spread to other communities as new tolled infrastructure places loads on adjacent un-tolled structures, with predictable results for the region. Further, toll evasion is threatening the financial viability of the Golden Ears and Port Mann bridge projects. They are simply not meeting their targets, and will be an on-going financial burden for Translink and province (respectively). Many have suggested a more equitable regional tolling policy would be fairer to communities, and would provide more stable funding for infrastructure improvements. I have suggested myself that the oft-cited $1 toll per crossing will not be sufficient to provide the funding we need if we are going to build more roads and bridges, nor do we know how that will impact regional driving patterns. So I have asked out staff to develop a policy paper (much like the one they did for the Pattullo Bridge replacement discussion) that analyses regional tolling policies, where they work and where they don’t, and the impacts on the region and the City of New Westminster if a strategy like this was implemented by the province as part of the 10-year Plan. As a Council, I want to be able to comment to the province from a point of knowledge, and not just engage in the spit-balling guestimating about what should work, like has marked so much of our regional transportation discussion. This Policy Paper development will be overseen by the new Transportation Taskforce, so I guess we have already started preparing the Terms of Reference! The Car-sharing co-op Modo already has several well-used cars in New Westminster, and there are two ZipCars at New Westminster SkyTtrain station. Car Sharing provides many potential benefits to residents who don’t necessarily want to own a car, but need one occasionally. I don’t see them as a “traffic reduction” solution so much as a space saving solution. The average car spends more than 90% of its time parked, and Cities need to provide between 2 and 3 parking spots for every car. That is wasted space that doesn’t really earn revenue and makes your city less livable. Shared cars reduce these impacts, and for many people, weekly or semi-monthly access to a reliable car can swing the difference between just giving up and leasing a Hyundai, or relying instead on more sustainable transportation in their everyday life, and only using a car when absolutely needed. In light of new models of car-sharing coming around (ZipCars runs slightly differently than Modo, but both rely on fixed locations for their fleet, Car2Go is much more fluid, and their fleet can move around quite a bit), and with potential benefits to the City of encouraging Car Share, it is a good time to develop a policy about how the designated parking and other needs of the Car Share industry (yes, it is an industry, although Modo operates as a Co-op) will be managed in the City. This was an update report on the progress of the ICI, which is a great direction the City is pursuing, and I will talk more about it in a future blog post. This is a procedural Bylaw under the LGA that allows us to set up a Line of Credit, in case we need to draw from it to pay temporary bills. Staff indicated we have not had to draw from our LoC in many years, but it is good accounting practice to have it there in case you need it due to unforeseen events. Already covered in detail! This is just the Chief election Officers official report as per the Act. Best I can tell, we have a 50% chance of getting this decision right, but a 100% chance of getting it wrong. Such is politics! This topic came to council via the Parks and Recreation Committee, and sprung at least in part from the mind of pedestrian advocate, West end resident, and 2014 nominee for Citizen of the Year Mary Wilson. She was concerned by a plan to remove some green space in the City from the public realm to private through a local redevelopment, and more holistically about the erosion of public greenspace across the City. 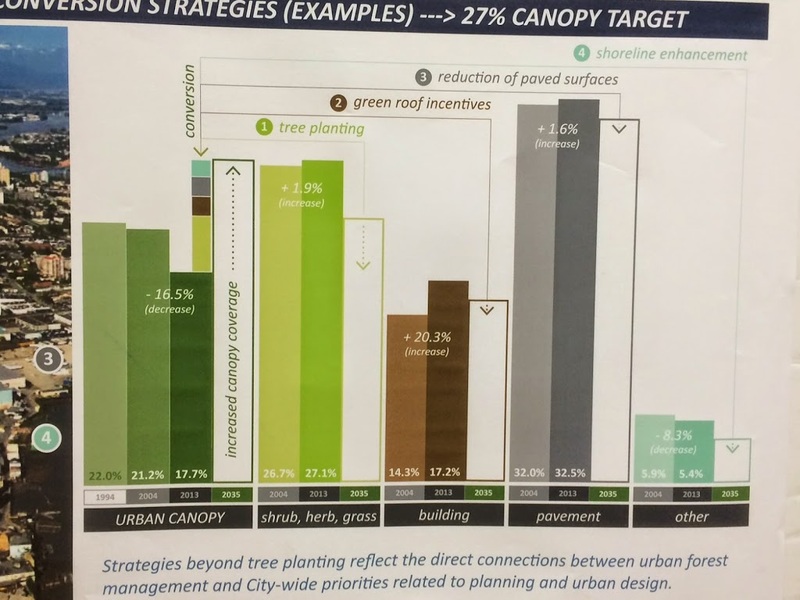 When I was (coincidentally) at the open house this week for the City’s Urban Forest Management Plan, I noted this diagram that showed how our City’s green space is threatened by the gradual increase of built and paved space. This in spite of New Westminster already having a region-leading percentage of our land covered with roads. The direction to staff is to plan an inventory of greenspace in the City, and to look for opportunities to protect and preserve it. I think this will end up dovetailing well with the City’s Urban Forest Management Strategy if we get far enough along that we are looking for planting areas to enhance the City’s forest. I am glad Mary brought this forward, and was very happy to support it. We have not taken action on these correspondence yet, but read ‘em and weep! Apparently a small portion of Alexander Street extends under the cladding of the Anvil Centre/Merchant Square by something like 50cm. As the City is the owner of both the Street and the Anvil, we must, to be compliant with the Local Government Act, grant ourselves an easement over that road space. We are moving to give the Engineering department the rights to negotiate that easement with itself.Yes, you read that right. …and that’s about it for my First Council Meeting (except for the singing). Posted on December 7, 2014 February 6, 2015 . by Patrick Johnstone. 1 Comment. No sign that I have been too busy to blog is more clear than the fact I have not had a chance to write about the election results yet. Things are settling a bit, and now that I can chew on the poll-by-poll results, I can start to throw some conjecture on top of my pre-conceived notions. I have my own ideas about what went well during my campaign and what didn’t. I also put a lot of effort in during the campaign to get out of my own bubble and talk to people who didn’t know who I was and didn’t already support me. Yes, the NWDLC endorsement helped, as did the Citizen of the Year legacy. However, even I was surprised at the doorstep how large a percentage of voters cared about environmental concerns – the coal terminal, Kinder Morgan pipeline, and tree protection in the City came up more often than I might have expected. This last one really buoyed my confidence as the campaign went on. I also had an extremely successful fundraising program, which allowed me to buy a lot of ad space on paper and on-line. This definitely showed during the last week of the campaign, as people at the doorstep really started to know my name before I could introduce myself. “Campaigning” is from the Latin for “shameless self-promotion”. This table shows (unofficial! 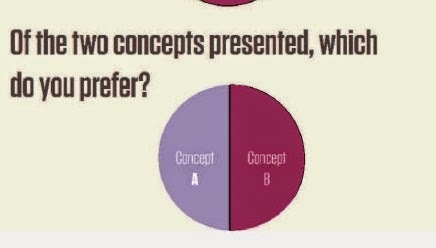 )poll-by-poll results. The winner of the poll is marked in dark green; the 2nd to 6th place finishers (i.e. the rest of the imagined caucus for that poll) are shaded light green; the 7th to 12th place fishers (let’s call them the shadow cabinet) are marked in light yellow, and the 13th to 18th place finishers (the also-rans) are shaded pink. The last three place finishers in each poll are not shaded. The next table is better for looking at overall trends, but this is better for looking at anomalies. It is clear the Puchmayr and Williams dominated this election. They led the total vote count by a handy margin, and won 9 polls between them. Of the 38 polls they were in (19 each), they were in the Top 6 in 37 of them. The anomaly being Williams finishing 7th at Herbert Spencer, apparently the victim of a surge in Kainth and Folka votes from that Queens Park/Glenbrook North catchment. The other two Incumbents shared 4 poll wins, three for McEvoy and one for Harper. The former won three polls surrounding Queens Park, the latter we may start calling the “Mayor of Queensborough” with his solid win at Queen Elizabeth. The Queensborough vote is also interesting in that only 3 of the people eventually elected finished in the Top 6 here, with Cartwright, Kainth, and (Queensborough resident) Palmer filling the top part of the poll. The other similar anomaly is F.W.Howay in Massey Heights, where again Cartwright, Kainth, and Donnelly finished toward the top. I can’t help but notice I was not in the top 6 in either of these polls. I read this as saying I got a push from being supported by the Incumbents, as the “protest vote” generally didn’t fall towards me. No surprise there, as I did not run a campaign of protest. Speaking of protest, it appears the Great Sapperton Revolt promised by some during the lead-up to the campaign simply did not occur. Yes, Cartwright dominated the Pensioners Hall poll, and won the Richard McBride poll as well, but for the most part Incumbents did well in both of these polls, with almost all of them (4 for 4 in one, 3 for 4 in the other) finishing in the Top 6. I have my own theory about the Cartwright result. She was a well-spoken and easy to like candidate who, in my opinion, sold well to the traditional Betty McIntosh voter. I suspect she drew much of the vote that Scott McIntosh was hoping to receive from the name recognition. This shows in Cartwright’s strong result in the polls where incumbents did less well, and in the two Sapperton polls where Betty usually did well. This may also be reflected in that McIntosh the Younger did not get a similar boost in those polls (his 10th and 11th place in those polls is where he finished in almost every poll). Finally, I won a single poll – the one at the Shops at New West Station. I have no idea what that means – Who voted there? The residents of Plaza 88? SkyTrain users? People I met at SpudShack? If it was the Twitter/NEXTNewWest crowd, I would have expected Kainth to get a similar boost, but she finished pretty much at her average position in this poll. It’s a mystery to me what that poll means. Probably just another anomaly. yeah, click, in a second window, so you can refer back to it. At the right side, I added up every poll that the candidate won, and counted the number of polls in which they finished in the top 6. Then I calculated their average finish (which is only interesting in pointing out which polls the candidate finished higher or lower than their average), and the standard deviation (which showed some interesting results. The highlighted yellow squares are just numbers I wanted to draw attention to. Again, the Puchmayr/Williams dominance is obvious. For us newbies, I won a poll, but Mary finished in the top 6 in one more poll than I did. It seems intuitive, but only those who got elected finished in the top 6 of more than ½ of the polls. The Queen Elizabeth (Queensborough) poll isn’t as anomalous as one might expect, except that Palmer punched above his weight in his own neighbourhood, and Raj Gupta’s one-shot strategy of covering all of Queensborough with randomly-located signs definitely paid off, as he almost cracked the top 10, and wasn’t even close anywhere else. Showing how important it is to get out of your “bubble” during the campaign, both Cartwright and Kainth won more polls than Harper, me, or Trentadue, but finished behind us because they had too many polls where they just didn’t show. The Standard Deviation column shows the consistency across polls. No surprise Kadioglu was the most consistent, finishing dead last in every single poll, but the consistency of Puchmayr is an example of what you need to do to win the election overall. I’m actually a little disappointed with my SD of 2.5, as I spent a lot of time every neighbourhood in the City. I spread my doorknocking around, especially early when I was purposefully trying to gauge and engage the populace in different parts of the City. I think an interesting contrast is Kainth’s SD of 3.8 when compared to Brett’s notable 0.8, especially as I saw them as running very similar campaigns. They both had great sign strategies, spend a lot on newspaper and on-line ads, and had great social media presence. They also both have deep community roots and could conceivably draw from established constituencies. Despite these similarities, Kainth saw either very high or very low support where Brett was remarkably consistent, finishing pretty much 10th across the board. Which proves, as I always expected, I know nothing at all about politics. Posted on December 2, 2014 February 6, 2015 . by Patrick Johnstone. Leave a comment. OK, we are a little more caught up now: on my sleep, on post-campaign tasks, on re-aligning lifestyles, and with the reality that my reality has now changed. I guess I should blog about what it is like to be a City Councillor, now that I have something like 24 hours of experience. Yesterday’s inauguration was a good symbolic break from the many times I sat on the pews to the time I get the comfy seat. Without a “real business” agenda, it allowed me to get more comfortable with the new setting. So the strangeness of the experience wasn’t overcast by our need to get some work done. That’s next week’s story. I’m not often one for pomp and ceremony, so some parts of the ritual seemed a little strange for me. The legal requirements for the oaths are understandable, but there are other parts of the tradition that I’m not too sure about. It was nice, however, to see so many faces in the crowd that were supportive during the campaign, and some I had only met during the campaign. I really appreciate people coming out to see us off on this new adventure. Less said about the Parcel Tax Roll Review Oath the better. Clearly the voters can elect a Council, but they can’t be trusted to elect a Choir. So, aside from yesterday’s Inauguration Meeting, I have had an opportunity last week to sit down with a few senior staff in the City and start my training. I have had a lot of interaction with Staff and Council in New West in my volunteer life, so I have some basic understanding of how New Westminster operates at the superficial level. I have also worked in a City Hall, so I have some understand of the major day-to-day operational parts of a local government. However, none of that is useful without understanding the cultural and organizational differences between the two workplaces, and seeing how the operation is viewed from inside, which is inevitably different than the view from outside. I have another all-day session planned before Christmas with senior staff from each department to drill down a little deeper into existing operational plans, strategies, and outlooks. I am definitely on the steep part of the learning curve, but that where I love to be. I also filled out a bunch of HR paperwork. So it wasn’t all fun and giggles. 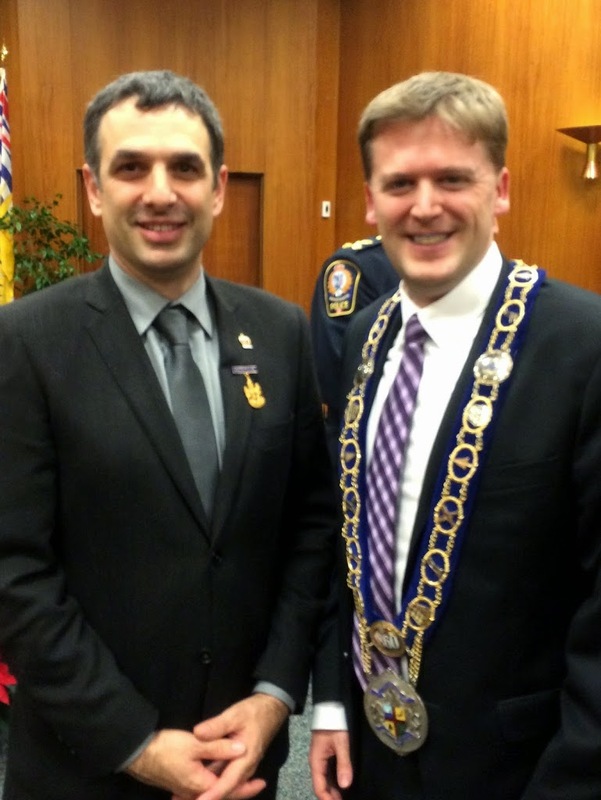 Finally, I have had some discussions with the new Mayor about strategic planning for the upcoming term. As disclosed during his Inaugural Speech, there are no real surprises: his priorities are clear (transportation, economic development, leveraging the RCH expansion, community engagement) and I look forward to working with him and the rest of my Council team to see those visions realized. In the short term, Council has our first “real” meeting next week, then some time over the Christmas break to get our Committees and Task Forces organized. The members of Council have provided the Mayor our “preferred” list of committees, and I think I know where I will be most useful, but ultimately it is one of His Worship’s supreme powers to decide who chairs which committees. As soon as I know for sure where I will be assigned, I’ll let you know.